Before one daughter photographed the other photographing this obliging Pisan dog now introduced to you, they had spent the entire night walking round and round Siena, there being no room for them in the inns. 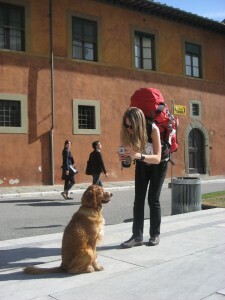 NZ girls WOOFing in Italy. At any moment, however, they were only a text message away from home. I think this is leading to a discussion about ‘small world’. This morning I sat and looked at a lighted candle for a little while, and tried to think about breathing without thinking about it. I find this very hard (hints and companions are welcome). And yet I didn’t feel alone. People all over the world do something similar — tens, maybe hundreds of thousands at any given time. I opened emails from friends: E in Argentina planning for my visit there in September so we can finish co-writing a bilingual novel; D in Utah delights in my delight in her manuscript; Burmese K, newly emigrated to the US, has a translation for me to edit. We’ll meet in September, too. I’ve heard from India, Edinburgh and Iowa this week. Overnight ‘Meeneusia’ has commented on my blog, whose own blog language I can’t even discern, but our lives and thoughts have now touched. What once seemed extraordinary is now the ordinary, fabulous, webby fabric of our lives. Just as rich as going away later in the year will be staying home tonight with friends, face to face, sharing food by the fire. Face to face or via the ethers, whatever we do, we do with others — even breathing quietly in a room alone.